Compiled by nationally recognized experts in ASC finance and illustrated with real-world examples from ASCs, this book covers the fundamental concepts every ASC manager needs to know to protect the financial health of their ASC. 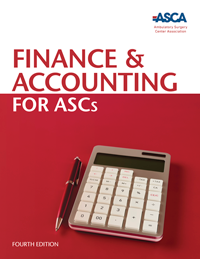 Chapters on basic accounting principles, financial statements, financial analysis and budgeting serve as essential tools for training new ASC staff and as a comprehensive review for experienced ASC managers. All material in this latest edition has been reviewed and updates made if needed. A new chapter on strategic planning helps ASCs build for tomorrow based on their strengths and weaknesses today and can help users take their facility to new heights.